Presenting Five More Ideas inspired by Tim Neve's "Beachcomber" look - remember, this is a look that incorporates what you already have in your home, and strives to not be "cluttered". 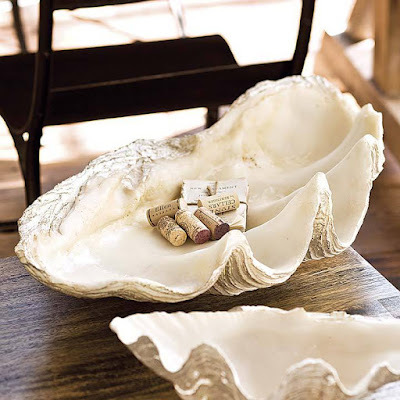 Which can be a challenge with your collection of found sea shells and driftwood. 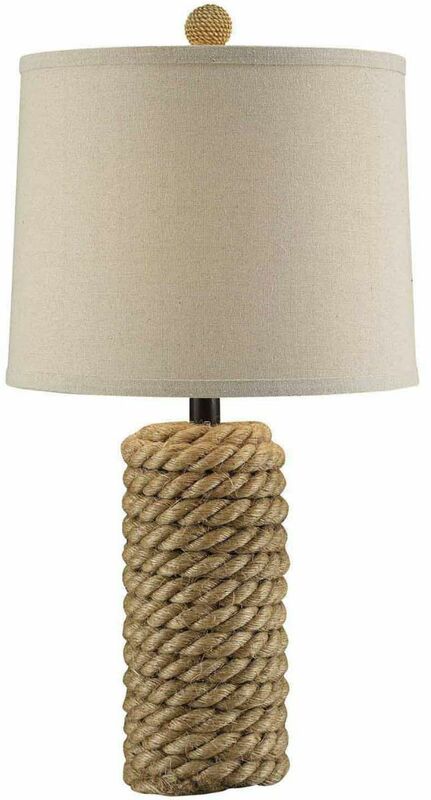 What we are going for is a slightly-rustic beach house style for fall, but still elegant and welcoming. 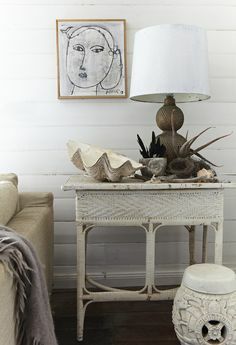 Styling by Tim Neve- love that vintage wicker piece! 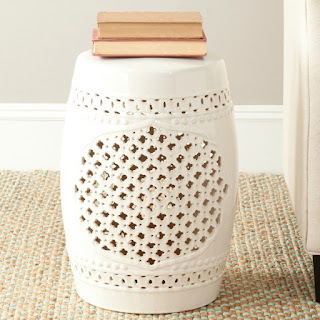 Image from "Sand Castles"
Neutral tones full of texture with the large seashell, white wicker table and the interestingly patterned garden stool echoing the style. Note also the grey fringed wool (cashmere?) casually thrown with the mix, creating a warmth and luxury texture in this space. 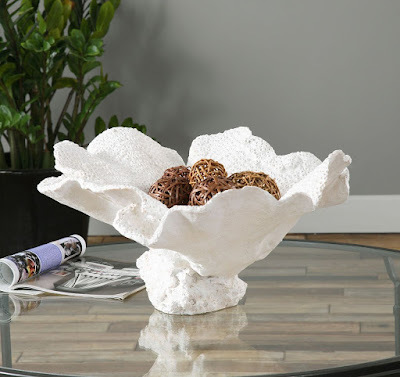 Easy to create for fall - just hide your bright colors, add a throw in soft beach tones of driftwood or grey, and then arrange your favorite summer found seashells! 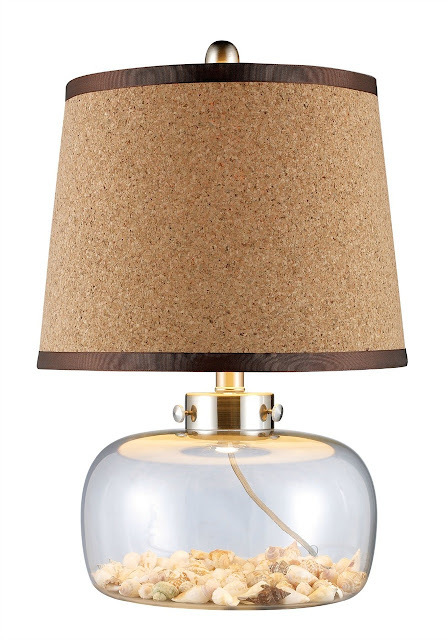 A "fillable" glass lamp is always my go-to if you have limited space and lots of beach "finds" The natural cork shade and chocolate ribbon detail on this Margate Lamp gives it just a little extra "oomph"
2. 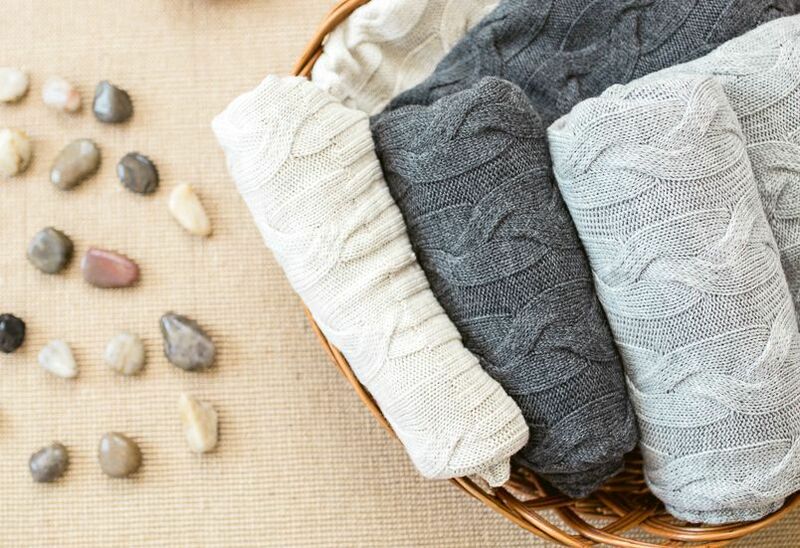 Add a knit throw - use pattern and texture in neutral shades to create the calming sense of fall at the coast. Cable Knit Always works - love the classic styling for all seasons! 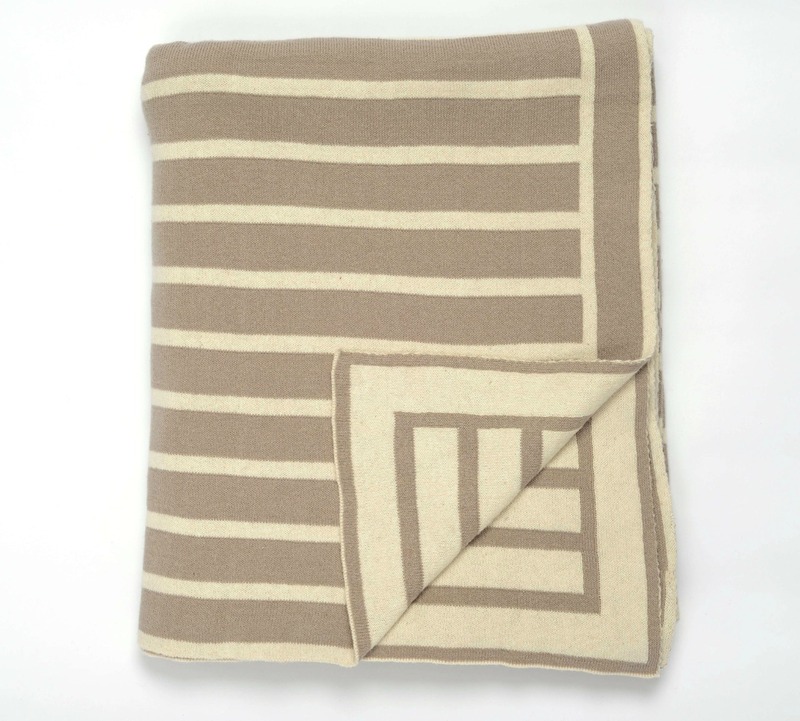 Stripes in pretty "driftwood" are always a welcome addition! 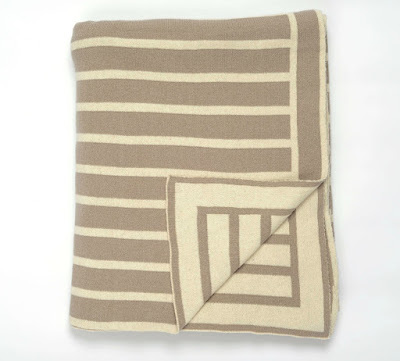 Love this Beach Striped throw for its' incredible knit softness and for the reversible striped look. 3. Use an interesting bowl or Large Clam Shell (can be faux!!) 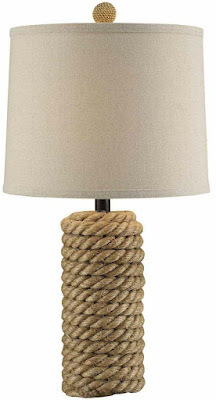 for showing off your summer collections. Don't hide those special memories of time at the beach - show them off in something natural and pretty. 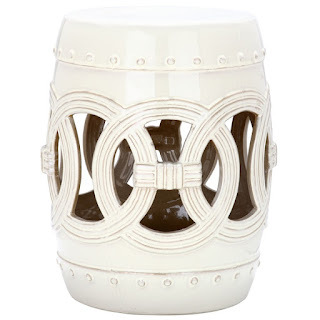 There are so many options for finding the right ceramic stool for your home, the above examples are just a few that I found for around $105.00 at Overstock.com. 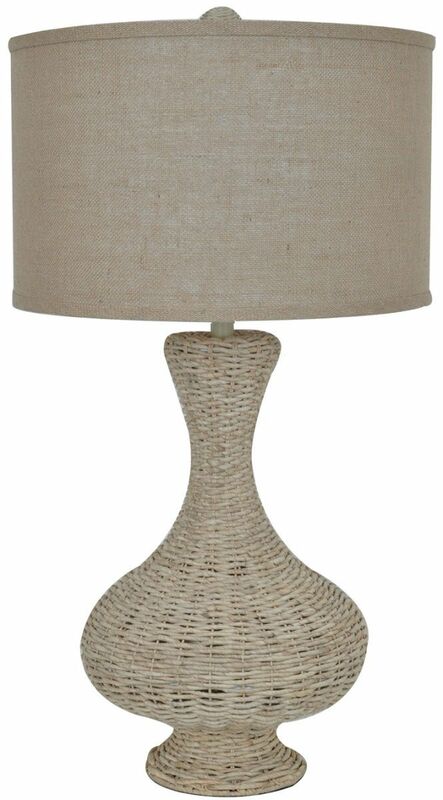 The trick is to find the right one that fits your style to add some interest and functionality to your room. 5. Think about trading out your art for the season. 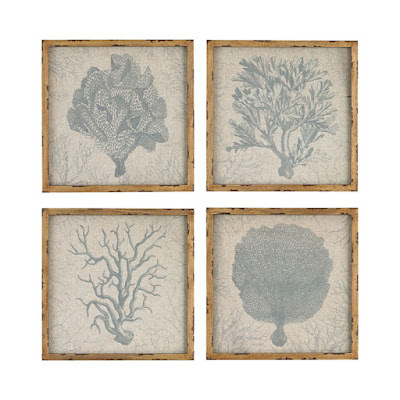 Simple frames in beachcomber tones of warm wood, or beach washed grey. Doesn't have to be expensive - could even frame inexpensive black and white prints, or try my favorite idea of framing a nautical chart from your surrounding bay. Vintage artwork is always fun too! 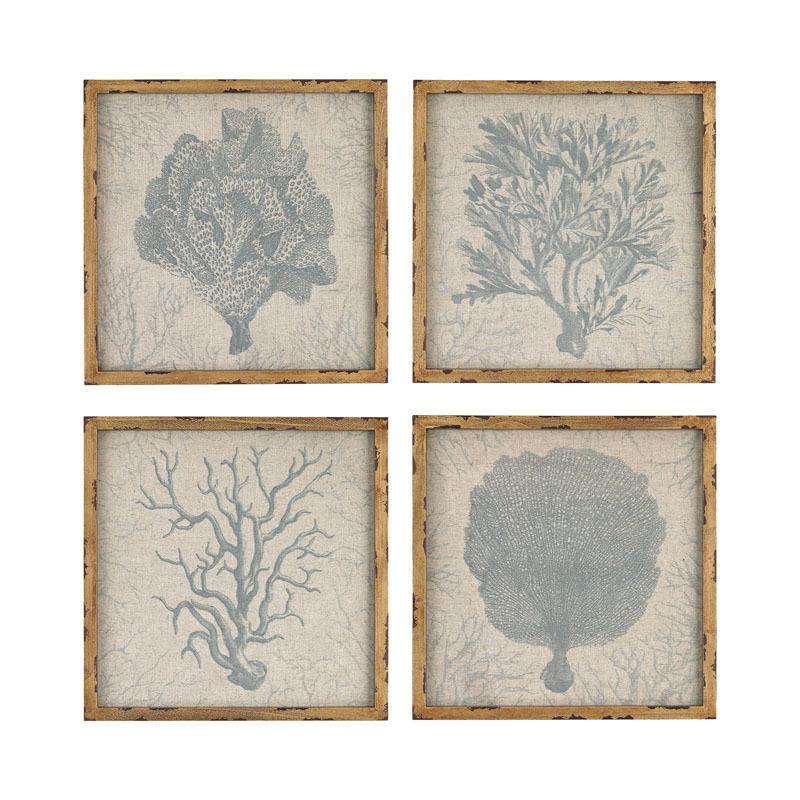 Or vintage-like art, look for distressing and natural textures like the linen fabric backgrounds in these Calming Coral Sealife pieces. 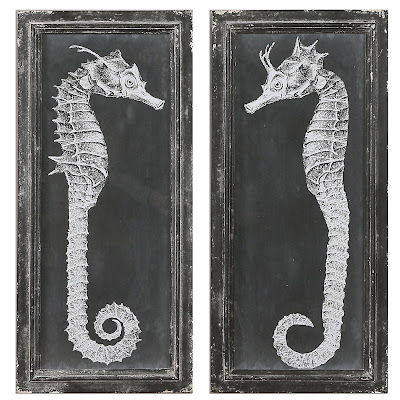 Seahorse Prints in Rustic Frames - My new faves! 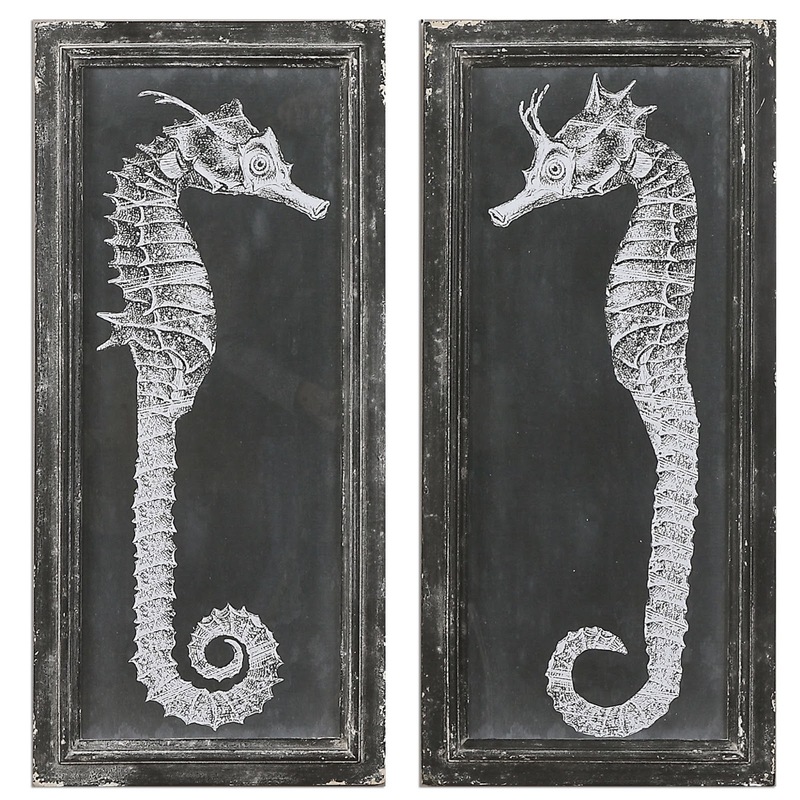 Take a look through what art you already have hiding in another room in your home, maybe just do a little rearranging? We are hoping to inspire you to slow down, take a deep breath and live at the beach every day of the year. Sand Castles can be purchased at Liberty Bay Books on my Book Page!